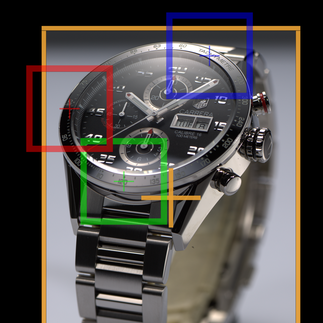 CAPcam application is divided into four panels. The configuration panel aligned on the left side can be shown/hidden using the arrow button in the lower left corner. The control panel at the right side contains any controls for focussing and releasing the camera. In LiveVideo mode, this panel will detach and float on top. Using the scroll wheel when pointing to a numeric value incrementally changes the value and adjusts the orientation of the focal plane. The status panel shows an overview of the selected hardware, additional cursor information and status or error messages. The image panel displays the image with focus handles and overlayed grid, showing the orientation of the focal plane. Any mouse operation inside the image panel (scrolling, drag n' drop) does not influence the focal plane. To manipulate the focal plane, cmd-key must be pressed. The colors used for the different controls are showing their relations. 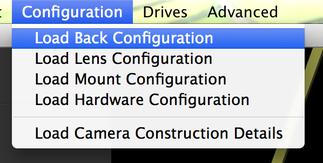 Any lens or back comes with a dedicated configuration file. There are also configuration files for any possible mounting option. Chose the appropriate INI-file from the configuration menu. Connection mode buttons are placed in the control panel. CAPcam starts in this mode. Connection to the camera is not established. Any change in focus or shift is immediatly executed. Aperture and shutter are open. Live video on the back or the capture application allows to immediatly see any changes. The control panel is detached from the application and can be positioned floating above the live image. Camera does not move unless the CAPTURE button is pressed. When starting a new session it is recommended to reset any settings to their default values using Menu \Edit\Initialize. Menu \Edit\Undo discards any changes applied to the shown image. It has the same effect as reloading the image. Unlike other cameras, CAPcam allows to define individual distance to different points in the scene. The markers indicating where a distance value should be applied, are called focus handles. 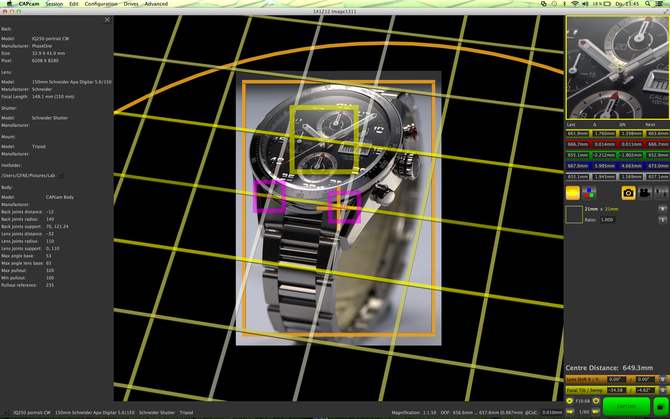 Handles can be moved with the mouse in the focal plane indicated by the grid. Moving handles does not change the orientation of the focal plane. But since different scene points have different distance to the sensor, the distance value will be updated. Distance is notated as the length of the light ray from a given point on the sensor (image) to its corresponding point in the focal plane of the scene. The colored bars in the control panel correspond with the focus handles in the image panel. The value 'Last' displays the distance setting used for taking the image actually shown. 'Next' displays the distance which will be focussed for the next image. Δ indicates the focus difference between the last and next image in viewers direction. 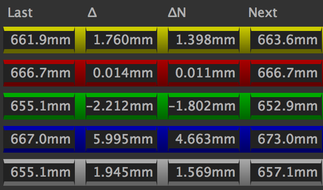 ΔN indicates the focus difference between the last and next image measured in the right angle to the focal plane. The gray bar is assigned to the cursor position. These values cannot be edited. Use the scroll wheel when the cursor is above the value to be changed. Select a colored bar or focus handle and use the scroll wheel while cursor is above the zoomed image crop. Press the cmd-key and use the scroll wheel while cursor is above one of the focus handles. The focal plane can be controlled using two different approaches. Modes can be switched freely during focussing. defines the distance to the yellow handle together with tilt/swing. Tilt swing can be controlled through the corresponding numerical values or by dragging the highlited grid lines while pressing the cmd-key. uses 3 distance handles (red, green, blue) to calculate tilt/swing. Any distance or tilt/shift reading is updated independent of the focussing mode. Editing tilt/swing automatically switches to single point focussing. The yellow handle is the anchor where the focal plane tilts/swings around. The grid visualizes the orientation of the focal plane. 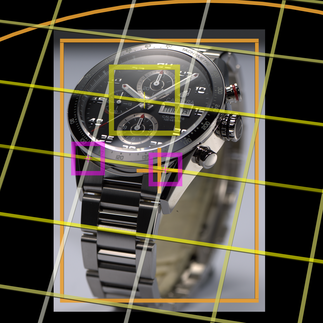 Moving the magenta grid handles changes the size and rotation of the grid on the focal plane. The orientation of the plane in the 3D scene is not affected by this. In single point focussing the two higlighted grid lines allow to manipulate the orientation of the focal plane. Press cmd-key while dragging the lines.